US Sailing recently launched a nationwide effort called “Good Luck USA,” an opportunity for fans to cheer on the teams that culminates with the Good Luck USA Olympic and Paralympic Send-Off presented by Maclaren, a special event for junior sailors hosted by Larchmont Yacht Club in Larchmont, NY on Saturday, July 14. “Every four years US Sailing’s Olympic Sailing Committee throws a very special send-off party for the Olympic and Paralympic Teams,” said Dean Brenner, the U.S. Olympic Sailing Team Leader. “We’re excited to partner with Maclaren, Sperry Top-Sider, Ben & Jerry’s, the JSA of Long Island Sound and Larchmont Yacht Club to introduce as many junior sailors as possible to the 2012 Olympic and Paralympic Sailing Team members. I encourage every junior sailor in America to make plans now to experience this once-in-a-lifetime opportunity.” The party runs from 3 to 6pm, and sailors under age 14 must be accompanied by an adult. 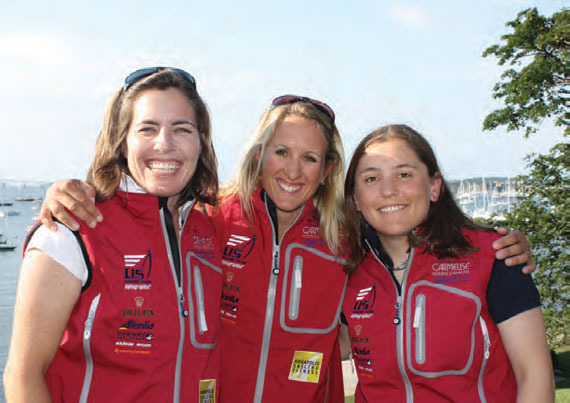 Attendees will have a chance to meet these members of the US Sailing Team Sperry Top-Sider: Paige Railey (Clearwater, FL) Laser Radial, Rob Crane (Darien, CT) Laser, Amanda Clark (Shelter Island, NY) & Sarah Lihan (Ft. Lauderdale, FL) Women’s 470,Stu McNay (Boston, MA) & Graham Biehl (San Diego, CA) Men’s 470, Anna Tunnicliffe (Plantation, FL), Molly Vandemoer (Stanford, CA) & Debbie Capozzi (Bayport, NY) Women’s Match Racing, Farrah Hall (Annapolis, MD) Women’s RS:X, Bob Willis (Chicago, IL) Men’s RS:X, Erik Storck (Huntington, NY) & Trevor Moore (Pomfret, VT/Naples, FL) 49er, Mark Mendelblatt & Brian Fatih (both Miami, FL) Star, Zach Railey (Clearwater, FL) Finn,Jen French & JP Creignou (both St. Petersburg, FL) SKUD-18, Mark LeBlanc (New Orleans, LA) 2.4mR, Paul Callahan (Cape Coral, FL/Newport RI), Tom Brown (Castine, ME) & Bradley Johnson (Pompano Beach, FL) Sonar. The Good Luck USA Olympic and Paralympic Send-Off presented by Maclaren, co-hosted by the US Olympic Sailing Committee and the Junior Sailing Association of Long Island Sound and supported by Sperry Top-Sider and Ben & Jerry’s, is a chance for young sailors to meet the 16 Olympic and six Paralympic sailing athletes who are competing in this summer’s Games. The party, featuring one-of-a-kind souvenirs, autograph sessions and a few fun surprises, is open to junior sailors from across the country and admission is free with advance registration. To register online, log onto olympics.ussailing.org/gousa. The 2012 Olympic and Paralympic Games are becoming known as the “social Games,” with the International Olympic Committee encouraging athletes to share their Games experience with fans and followers through Facebook and Twitter. The full Olympic competition schedule is posted at NBCOlympics.com, who will be streaming all of the Sailing events live online. The races will also be available in their archive. To learn more about the Olympic and Paralympic teams, visit sailingteams.ussailing.org.